Shirts With Random Triangles: Nick Saban Records Video About Suicide Prevention For University Of Alabama Mental Health Awareness Campaign. Nick Saban Records Video About Suicide Prevention For University Of Alabama Mental Health Awareness Campaign. Nick Saban. Image via al.com. 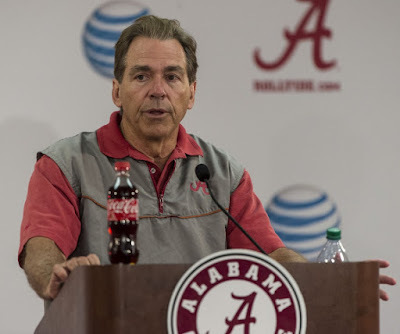 Alabama head coach Nick Saban recorded a video shown as part of a Mental Health Awareness Seminar held on the University of Alabama campus held on Wednesday. The video and seminar are part of an on-campus campaign at the University of Alabama called You're Not Alone, described by it's Facebook page as "a campaign aimed to raise awareness for mental health and suicide prevention." Saban himself has been involved with The Jason Foundation, a Tennessee-based youth suicide prevention group for fifteen years. He is also the honorary state chairperson of NAMIWalks Alabama, a 5k fundraising and mental health awareness event scheduled for Sept. 24 in Montgomery, Al.